“It is impossible to say how and when the Trump phenomenon will end,” Kevin D. Williamson writes in the latest Encounter Broadside. “It should end; rather, it never should have begun.” To which I can only add my hearty agreement. I am a white male, an evangelical Christian, and a conservative Republican. According to mainstream media, I should therefore be a supporter of Donald Trump’s presidential candidacy. I am not, I never was, and to be frank, I never will be. Trump has neither my vote in the GOP primary nor will he get my vote in the general election. He is a man and he may be a Christian (of some sort), but he has never been a conservative, and he has only recently become a Republican. Why he garners support among Republicans is a great mystery to me. The vast majority of Republicans don’t support him. 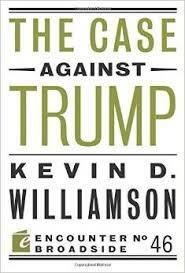 Williamson attributes Trump’s success so far to his willingness “to address the question [of immigration] from an American-interest point of view,” and to do it “belligerently”; to his “celebrity”; and to the “anti-trade hysteria” that results from “a crisis in American manhood.” Williamson makes the case that Trump’s celebrity is overrated because the candidate isn’t that good a businessman. (His father’s success is the foundation of his fortune, his brand is declining, and his company has sought Chapter 11 bankruptcy protections a record four times.) Williamson further argues that Trump’s positions on immigration and trade are both simplistic and unrealistic, not to mention wrong. But Williamson’s reference to America’s manhood crisis introduces the strangest section in his pamphlet. He writes of “American men born in the ’70s, or ’80s hark[ing] back to an imaginary blue-collar economy in which a man could earn a secure place in society (and hence in the sexual hierarchy) through simple dedicated labor at a factory.” The last three decades have not been kind to that imagined economy, but Trump’s supporters seem to be drawn from its imaginers. Take out the parenthetical remark and Williamson’s point makes sense. Trump draws support from disappointed, white, blue-collar workers who are frustrated with the direction the economy and the country has taken. It’s hard not to be sympathetic to their plight, even if you disagree with their policy choices. Sexualizing their disappointment, as Williamson does, is weird and underhanded.